In the individual website in the upper menu of the website management system, go to "Options" - "Website indexing settings" then click on the "Register website in search engines" hyperlink. 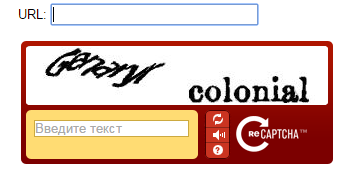 You will be redirected to the registering page, in which you have to input the address of your website (including the http://) and verification code from the picture, and then click on the "Add" button. After completing these steps your website will be queued for indexing, and will receive an index in about a month. 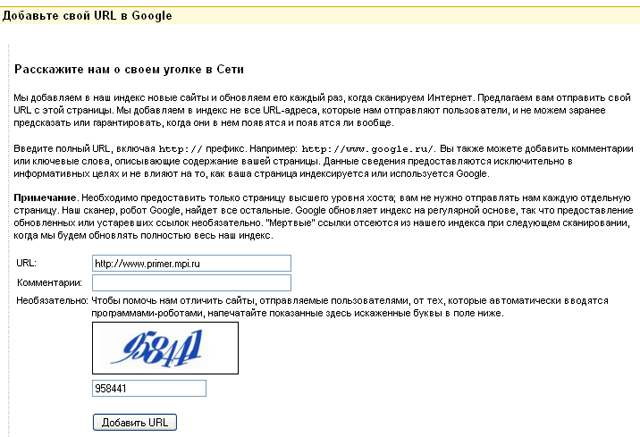 If the website already is indexed by the Yandex search engine (as it is in our example), the following message will appear: "The following URL has already been indexed"
In the individual website in the upper menu of the website management system, go to "Options" - "Website indexing settings" then click on the "Register website in search engines". In the opened page enter the address of your website (including the http://) and verification code from the picture, and then click the "Submit request" button. After completing these steps your website will be queued for indexing, and will receive an index in about two weeks. 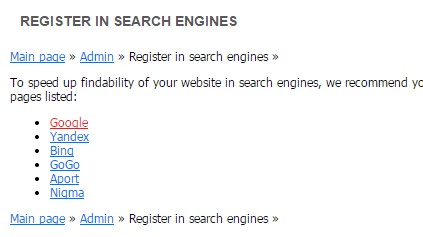 You can register your website in other search engines such as Rambler, GoGo.ru, Aport, Yahoo!.